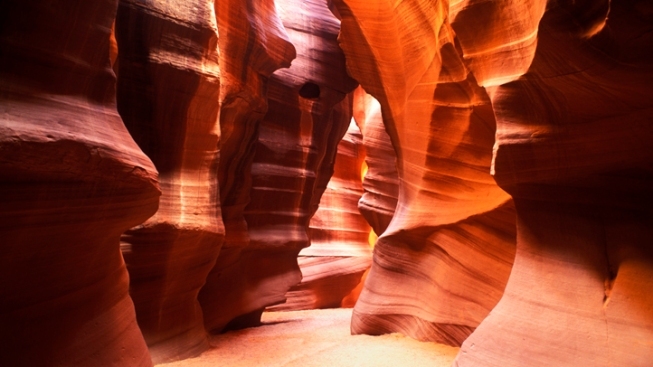 Located on Navajo land near Page, Arizona, Antelope Canyon is one of the state's most breathtaking hikes. The following content is created in consultation with Arizona Tourism. It does not reflect the work or opinions of NBC Chicago's editorial staff. To learn more, visit arizonaguide.com/chicago. It's been a rough winter in Chicago, even by local standards. Which means you could use a break from the arctic chill and abundant snowfall with a warm weather getaway. Fortunately, Arizona is the answer to your cabin fever. Bright sunshine, fantastic weather and breathtaking landscapes make Arizona an outdoor adventurist's paradise, no matter what time of year. And thanks to the state's unique geography, you can ascend from desert to Alpine pine forests in two hours, or even golf and wakeboard all in the same day. Add charming towns, luxurious spas and a warm climate ideal for getting outdoors, and you'll realize why Arizona is the perfect destination for a memorable and laid-back winter getaway. But with so much to experience, it helps having a to do list before you book your trip. Which is why we've put together a few of our favorite Arizona adventures. Any state that's home to the Grand Canyon is clearly blessed in the hiking department. But beyond Grand Canyon National Park (which can be explored by easy rim hikes or rigorous multi-day backpacking trips), Arizona offers some of America's best hiking through some of its most stunning landscapes. Our favorite trips include Antelope Canyon, a narrow slot canyon on Navajo land where beams of light illuminate the cavernous surroundings, and Sedona, where an extensive network of trails and unique Red Rock formations (like Cathedral Rock) make for a breathtakingly beautiful day on the trail. Feel like escaping the heat and getting even further away from it all? Head to the White Mountains, where you'll be greeted by lush Ponderosa Pines and powdery ski slopes. With three hundred days of sunshine a year and 60 miles of pristine waterways, Lake Havasu is a perfect playground for any boating enthusiast. Known as the "Jet Ski Capital of the World," it's also ideal for wakeboarding, flyboarding, kayaking and fishing, not to mention laying out on its pristine beaches. But the fun isn't limited to the water — golf courses, casinos and miles of off-roading trails will keep you entertained all day. Arizona's golf courses are as diverse and spectacular as the state's famed landscape. Ranging from desert target-style courses to links courses and alpine fairways, nearly every type of terrain—and difficulty level—is represented. And with more than 300 golf courses to choose from, you’re sure to find an ideal location for your golf getaway, not to mention a tee time that fits both your budget and your sense of adventure. Winter is a particularly good time to perfect your game, as courses in warm spots like Phoenix, Scottsdale, Tucson and Lake Havasu are in peak season. Of course all your adventuring should be rewarded with some pampering, and fortunately Arizona is equally blessed in the spa department. From Asian-inspired settings to Spanish-style retreats, Arizona's spas have been lauded by the likes of Conde Nast Traveler, Travel + Leisure and Zagat. Treat yourself to Mediterranean treatments, or stay local with body wraps, scrubs and therapies all using local ingredients and Native American traditions. In Arizona, the spa options are endless. To learn more about all Arizona has to offer and to start planning your next vacation, visit arizonaguide.com/chicago.